Item is a photograph of pinky boats racing in Baddeck N.S. 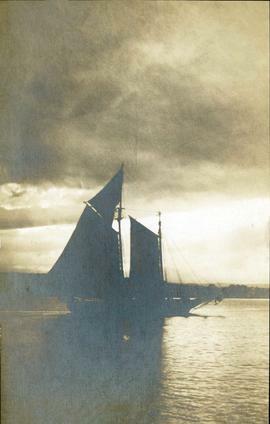 Item is a photograph of a sailboat on the Bras d'Or Lakes, near Baddeck. Item is a photograph of the HMS Comus which was a Corvette (type of ship) owned the British Royal Navy. The photograph was taken in Baddeck N.S. and the ferry The Marion is visible in the background also. Item is a photograph of a schooner built by Roderick McRae, it weighed 75 tons and was built in Baddeck N.S in 1869. Item is a photograph of a sailboat race at Baddeck. 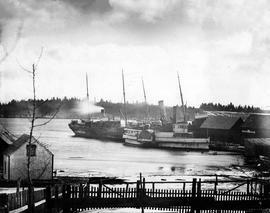 Item is a photograph of a Yankee Clipper in Baddeck on the Bras d'Or Lakes.